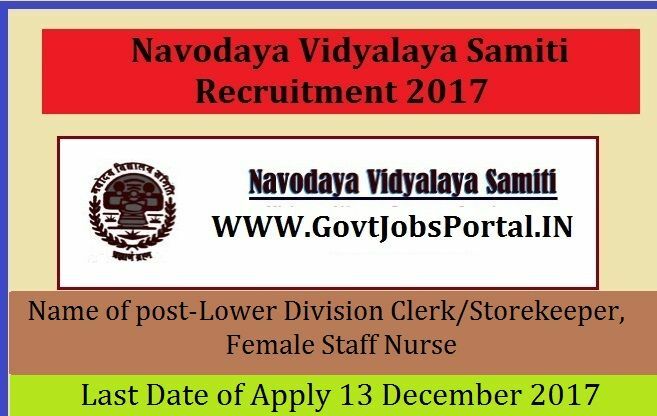 Navodaya Vidyalaya Samiti is going to recruit fresher candidates in India for LDC/Storekeeper, Female Staff Nurse Posts. So, those candidates who are willing to work with this organization they May apply for this post. Last Date of Apply 13-December-2017. Total numbers of vacancies are 683 Posts. Only those candidates are eligible who have passed Senior Secondary (Class XII) certificate from a recognized Board with 50% marks and possessing minimum speed of 30 words per minutes in English typing or 25 words per minutes in Hindi typing correspond to 10500 KDPH as on average of 5 key depressions for each word OR Passed +2 level or Senior Secondary Certificate from CBSE/State Govt. Indian citizen having age in between 18 to 35 years can apply for this Navodaya Vidyalaya Samiti Recruitment 2017. Educational Criteria: Only those candidates are eligible who have passed Senior Secondary (Class XII) certificate from a recognized Board with 50% marks and possessing minimum speed of 30 words per minutes in English typing or 25 words per minutes in Hindi typing correspond to 10500 KDPH as on average of 5 key depressions for each word OR Passed +2 level or Senior Secondary Certificate from CBSE/State Govt. What is the Process for Selection this NVS job? What is the Application Fee for these NVS Jobs in India?